The Uffizi houses an exhibition on the master of Gothic art and his influence on other artists. Giotto will be the undisputed protagonist of the exhibition which, from June 10 to November 2, will gather at the Uffizi about sixty masterpieces coming not only from the museum’s collection, but also from important international museums. In a difficult century such as the 14th century - characterized by famine, floods, conflicts between the Guelphs and the Ghibellines, and most of all by the terrible Black Death epidemic in 1348 – Florentine and late-medieval art, on the contrary, experience a period of absolute splendor, during which Giotto becomes the major exponent of the artistic scenario of that amazing era. Giotto’s legacy. Art in Florence between 1340 and 1375 is truly rich: Giotto’s works, of course, but also many sculptures (like those by Andrea Pisano) or paintings (by Agnolo and Taddeo Gatti) gathered for the occasion as in a sort of overall balance of the Florentine art production after Giotto’s death. 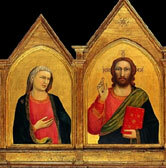 Here is how Antonio Natali, director of the Uffizi, explains this choice: «The title Giotto’s Legacy is really the only title that can synthetically illustrate what the visitor will see displayed in the halls: not a boasted legacy, but creators of artifacts who were born from the “rib” of the supreme innovator, Giotto; or who, viceversa, deviated from his influence, though affected by him». The exhibition also includes an exceptional event: for the first time Giotto’s Polyptych, housed in the North Carolina Museum of Art in Raleigh – U.S. returns to its city of origin. Recomposed only in 1947, it has unanimously been acknowledged as being the one which was originally located on the altar of the Peruzzi Chapel in Santa Croce in Florence, frescoed by Giotto around a 1315. This display is accompanied by a second exhibition at the Gallery of the Academy on Giovanni da Milano: Gothic masterpieces between Lombardy and Tuscany, which represent a different influence of Giotto’s art also in northern Italy. «Fourteenth-century Florence was open to artists coming from elsewhere – a common characteristic of the city’s long artistic history. They came from various states of the Italian peninsula as well as the northern European countries, says Cristina Acidini – Superintendent of the Polo Museale Fiorentino. For this reason, our collaboration with important museums, which I’m especially pleased with, allows the exhibition at the Uffizi to find its perfect match in the monographic display dedicated to Giovanni da Milano». The two exhibitions are part of the program A Year of Art and share the title of Splendors of the Gothic – from Giotto to Giovanni da Milano. Period: June10 to November 2, 2008. Opening hours: Tuesday-Sunday 8.15 – 18.50; from July 1 to September 30 every Tuesday and Wednesday, extended opening hours of the museum and the exhibition until 10pm; Monday closed. Admission: €10.00 (includes admission to the museum); concessions €5.00 for EU citizens aged 18 – 25; free admission for EU citizens under 18 and over 65. 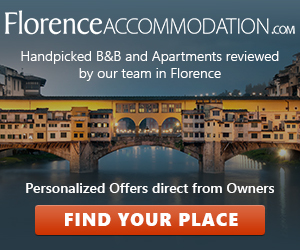 Info and booking: Firenze Musei Tel. 055 2654321.